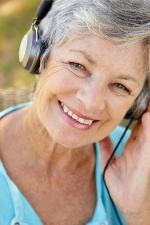 A new health breakthrough found that music can significantly reduce anxiety during cataract surgery. Audio therapy, the use of music in healing, is not very well known, but has shown great promise in many applications, including helping patients recover from surgery. In the United States, there are more than three million cataract surgeries performed every year. The new study regarding cataracts and audio therapy was presented last week at the 116th Annual Meeting of the American Academy of Ophthalmology. This kind of audio therapy uses “binaural beats”—two tones each pitched at a slightly different frequency, each delivered to separate ears via headphones. This practice causes certain brainwaves that are linked to relaxation and reduced fear and pain. Of course, since the target of their surgery is the eye, cataract patients undergo a great deal of stress and anxiety before a procedure. Researchers here combined binaural beats with soothing music and nature soundscapes (like ocean waves) that were familiar to patients. They found that patients who listened to this before, during, and after cataract surgery had less anxiety and a slower heart rate than those who did not receive the therapy. They also had reduced blood pressure. Cataract surgery was used for its anxiety-producing effects. It is performed typically under local anesthesia, and the patient is awake and exposed to unusual and stressful sounds (like surgical tools and medical banter). The surgery is effective and safe, though a common reaction would be to worry about future vision and quality of life. While cataract surgery was the focus of this study, the audio therapy could be helpful for any number of procedures in which the patient is still awake. As the population ages, issues like cataracts are going to be on the rise. A simple and inexpensive therapy that uses sound could deliver major benefits, both emotionally and physiologically. One participant in the study reported that during her first cataract surgery, she was afraid from the very first moment. It lasted far longer than she anticipated. Audio therapy during her second surgery dramatically changed the experience. There was little anxiety, and the surgery was over before she knew it. “Soothing sounds during cataract surgery reduces patient anxiety,” American Academy of Ophthalmology, November 12, 2012.